A character in an Evelyn Waugh novel once remarked that ?There's nothing wrong with war?except the fighting.? 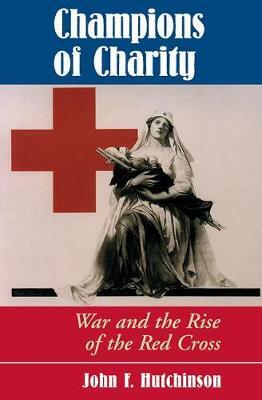 In Champions of Charity, John Hutchinson argues that while they set out with a vision to make war more humane, the world's Red Cross organizations soon became enthusiastic promoters of militarism and sacrifice in time of war.The mass armies of the nineteenth century were stalked by disease and slaughtered by ever more destructive weaponry, arousing the indignation and humanitarian concern of self-appointed battlefield Samaritans, who envisioned a neutral corps of volunteer nurses who would aid and comfort wounded soldiers, regardless of nationality. But the champions of charity soon became champions of war.Florence Nightingale was among the few at the time to recognize the dangers lurking in the Red Cross vision. She refused to join, and warned its founders that the governments of the world would cooperate with the Red Cross because ?it would render war more easy.? She was right; starting in the late 19th century armies simply used the Red Cross to efficiently recycle wounded men back into the frontlines.In World War I, national Red Cross societies became enthusiastic wartime propagandists. This was true in every combatant nation, and it is a transformation well portrayed by the fascinating selection of art in this book. Soon Red Cross personnel were even sporting military-style uniforms, and in the United States, the Red Cross became so identified with the war effort that an American citizen was convicted of treason for criticising the Red Cross in time of war!The Red Cross played an especially important role in encouraging the mass involvement of women in the ?home front? for the first time. It did this through magazines, postcards, posters, bandage-rolling parties, and speeches that blended romantic images of humanitarianism and war into a unique brand of maternal militarism. A true pioneer in mass propaganda, the Red Cross taught millions that preparation for war was not just a patriotic duty, but a normal and desirable social activity.The Red Cross societies had proven their usefulness in mobilizing civilians in wartime, and most of their functions were taken over by government agencies by the time of World War II. Gradually the Red Cross became better known for its work in public health, disaster relief, and lifesaving classes. But the legacy of a darker past still lingers: the red cross on a white background found on army ambulances, or the unsubtle subtext of sacrifice and heroism in Red Cross television advertising.It is a legacy the Red Cross itself has preferred not to acknowledge in its own self-congratulatory literature. For not only was the humanitarian impulse that inspired the creation of the Red Cross easily distorted, but this urge to militarize came from within its own ranks. This startling and provocative history of the Red Cross reminds us of the hidden dangers that sometimes come cloaked in the best of intentions.